But if Triangle remains central to accounts of industrialization’s brutalities in the United States, why has the Collinwood Fire, which took place three years earlier, been forgotten in text books and history surveys? Examining the different trajectories over time of these two disasters encourages students to think about history as a changing process, an account of the past that stands open to revision and reinterpretation. Ask students why they think Triangle “dwells in the collective memory of the nation” while the children at Collinwood have fallen into obscurity. Below are some questions and materials to facilitate thinking comparatively about the two fires and their aftermath. The Triangle Fire erupted in a high rise building in New York City. The Collinwood Fire broke out in an industrial suburb of Cleveland. How might this difference in location impact national news coverage and the enduring memory of the events? Effective political advocacy often depends on casting good and evil strongly against one another. How do the articles below (click on the headlines) describe responsibility for the Collinwood and Triangle fires? Why would the account blaming the owners of the Triangle factory be more useful to reformers than the story about “conditions” at the Lake View School? What role did people have in creating Collinwood’s deadly “conditions”? Why weren’t particular people blamed for the disaster? Should someone have been? Think about the school’s architecture and the difficulty teachers had maintaining order in the midst of danger. Cleveland News, Mar 11, 1908. New York World, April 11, 1911. In Ohio, the Collinwood fire led to substantial changes in school building codes, but elsewhere changes were modest. Most accounts of the Triangle fire, on the other hand, emphasize that legislation responding to the fire vastly improved worker safety. Why do you think history has favored telling Triangle’s story of Progressive triumph rather than Collinwood’s story of largely absent reform? Why is it important to remember persistent social failures as fully as successes? While Brooklyn Daily Eagle, Nov 7, 1915. After another tragedy, corpses clog the fire escape at the Diamond Candy Factory building. New York State passed fifty-six laws protecting workers in the four years following the Triangle fire, many of them included compromises to placate those who resisted governmental regulation of private enterprise. Even more important, agencies lacked the personnel and power to consistently enforce compliance. The owners of the Triangle factory, for instance, re-opened their business in a different high-rise building in New York City, regularly violated fire and safety regulations, but suffered only ten and twenty dollar fines. In 1915, the Diamond Candy Factory fire in Brooklyn killed twelve and injured dozens more when employees in various parts of the building found it impossible to escape. 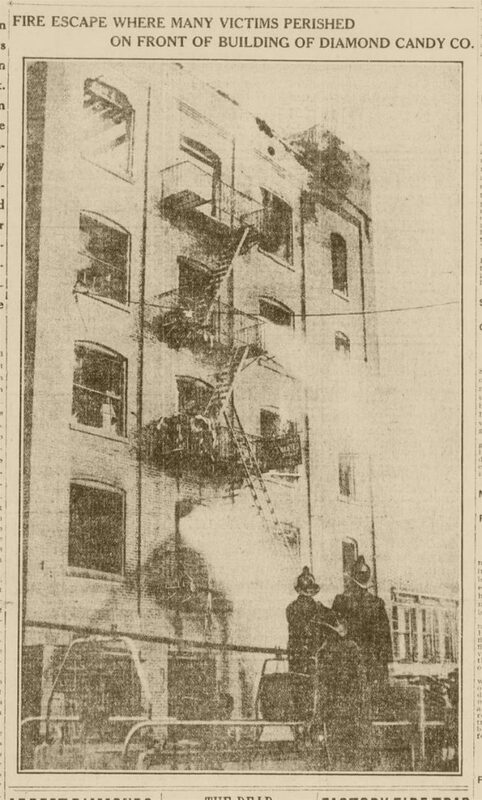 The New York Times described “girls leap[ing] from windows” to escape flames and “burn[ing] like torches on [the] red hot grill that had been a fire escape.” Many of their bodies lie where they died in the photograph to the right. 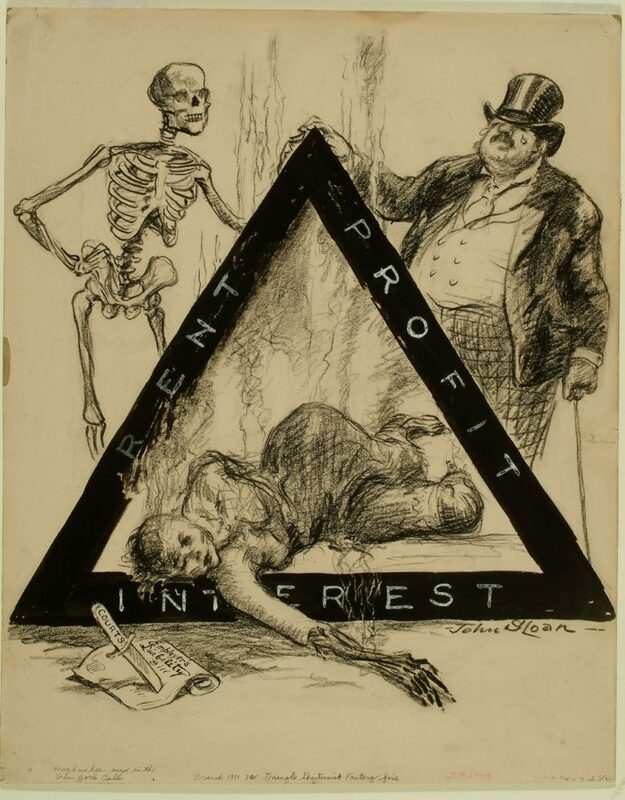 What does this 1915 news story about the Diamond Factory Fire tell you about workplace safety in New York, even after four years of investigation, protest, and safety legislation?